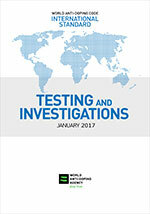 USADA makes available a number of publications, policies, and procedures to help athletes and others understand anti-doping responsibilities such as USADA’s testing program, the WADA Code, the WADA Prohibited List, the International Standards, therapeutic use exemptions (TUE), Whereabouts responsibilities, and the sample collection process. 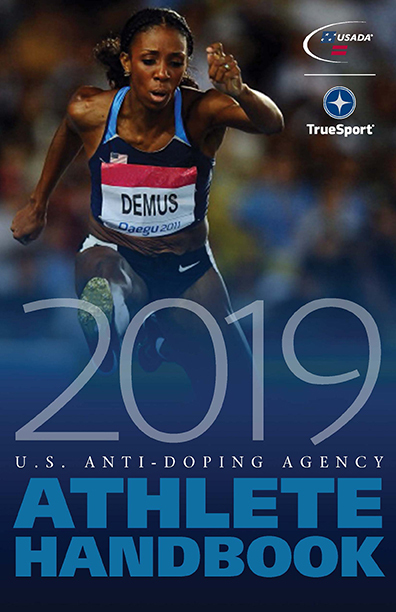 Furthermore, USADA makes available information and resources for athletes, parents, coaches, teachers, community program leaders, and other USADA stakeholders. 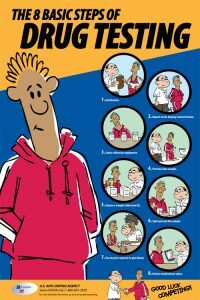 These resources include a nutrition guide, educational curriculum and activities, and literature on the importance of competing with integrity, honesty and sportsmanship. 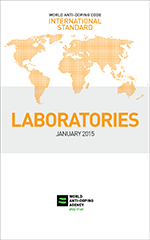 This page contains a list of USADA and other related publications, policies, and procedures. 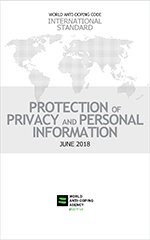 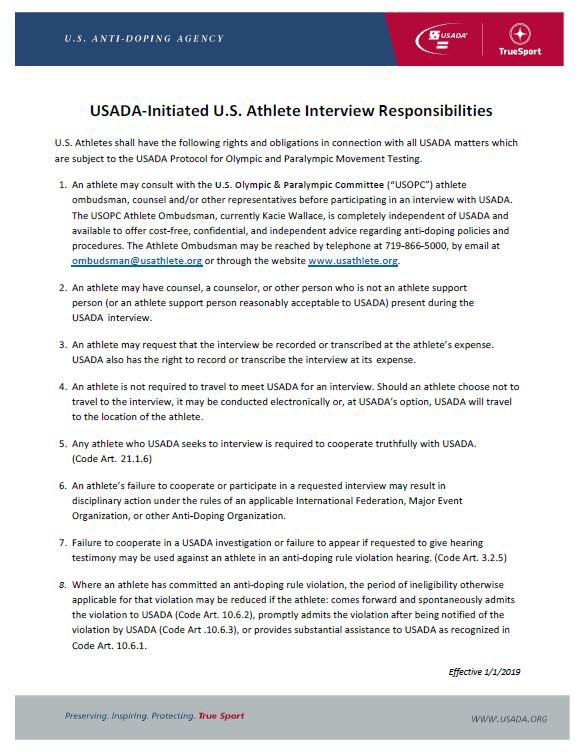 **All content found at USADA.org and its subdomains are property of the U.S. Anti-Doping Agency, and as such, may not be copied or reproduced without USADA’s express written permission. 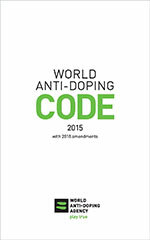 A comprehensive resource providing an overview of the doping control process, athlete rights and responsibilities, and other crucial information. 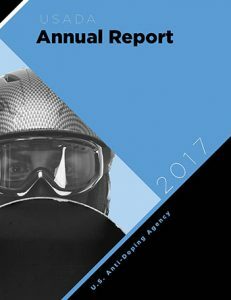 A condensed resource providing an overview of the doping control process, athlete rights and responsibilities, and other crucial information for young athletes and their parents and coaches. 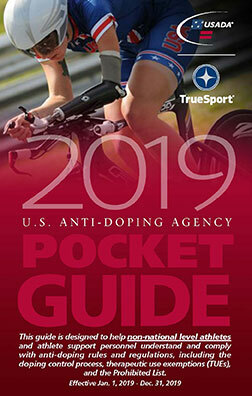 The 2019 Pocket Guide is also available in Spanish. 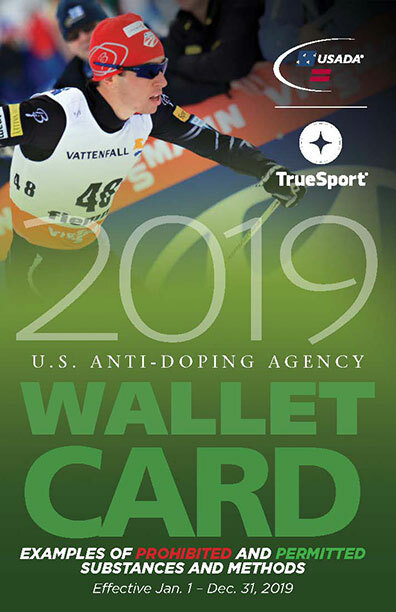 The 2019 Wallet Card is also available in Spanish. 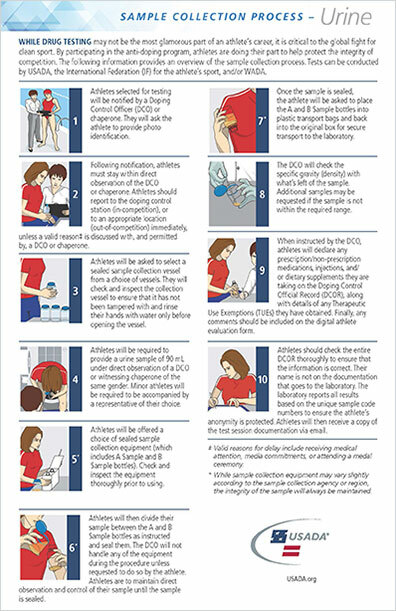 A quick summary of the urine sample collection process, along with athlete’s rights and responsibilities once notified for testing. 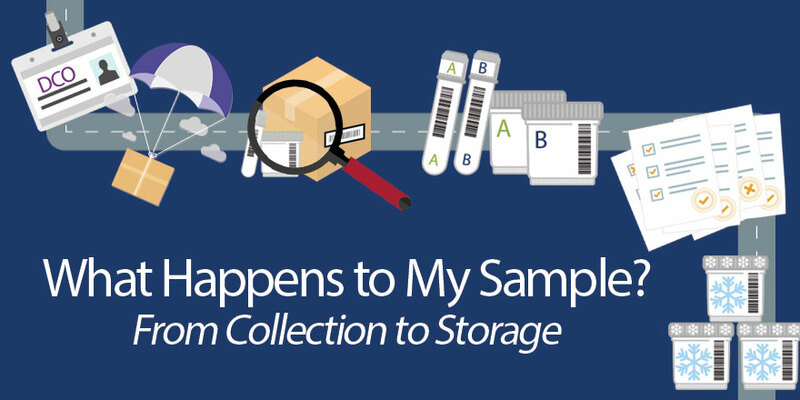 A detailed resource providing an overview of the doping control process, answers to frequently asked questions asked by athletes, and ways you can help elite-level athletes stay compliant with their anti-doping responsibilities. 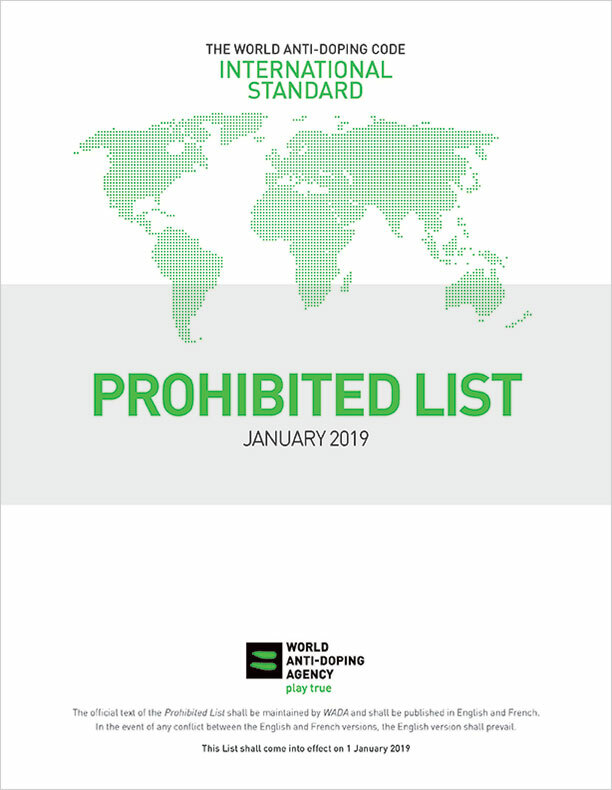 Comprehensive document outlining the protocol and policies for our anti-doping programs and implementation in the Olympic, Paralympic, Pan American and Parapan American movements. 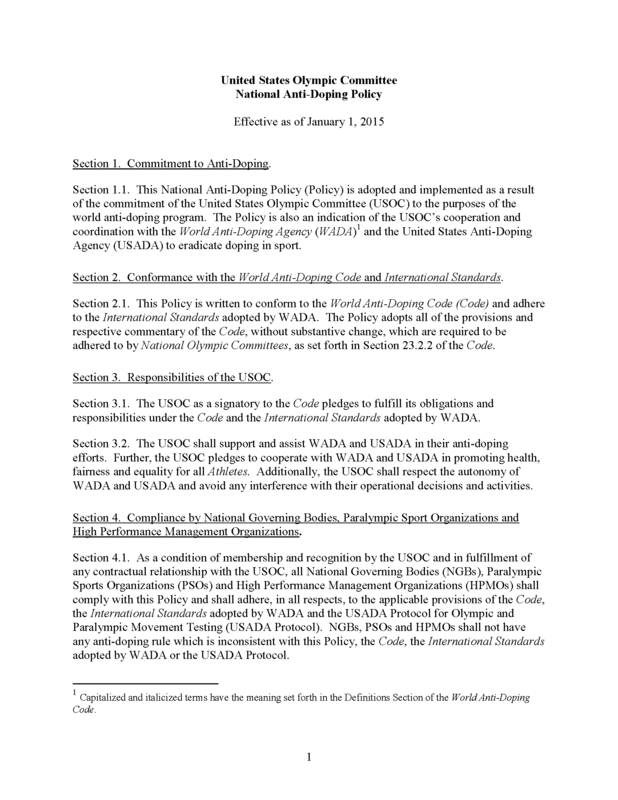 Anti-Doping Policies of the United States Olympic Committee. 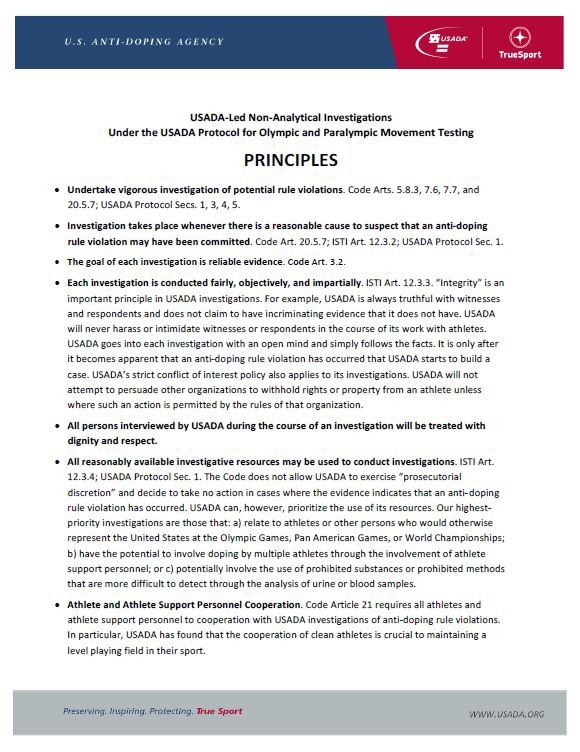 This policy outlines athlete’s rights and obligations in connection with all USADA matters which are subject to the USADA Protocol for Olympic and Paralympic Movement Testing. 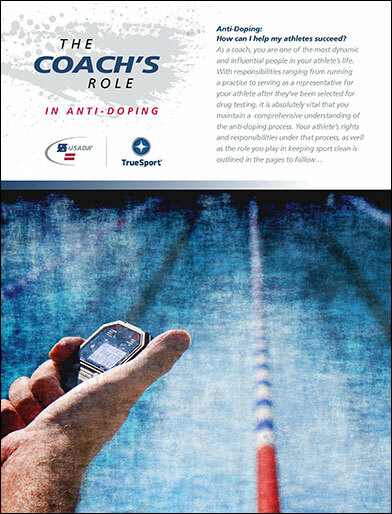 Consistent with the WADA ISTI, all athletes in the USADA Registered Testing Pool must comply with the whereabouts requirements in this Policy. 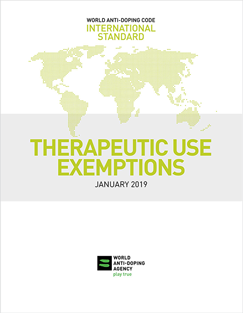 Consistent with the WADA International Standard for Therapeutic Use Exemptions, the policy explains the process for TUEs.
USADA is pleased to share its Annual Report for 2017, which includes a independent financial audit report and highlights of the year’s activities.